Sweet cinnamon cookies, rolled and cut into fleur-de-lis and alligator then topped with royal icing and purple, green and gold for Mardi Gras. I just recently did a recipe for King Cake Bread, that was defiantly a hit at my household I guess that means I have to make another one. These cookies are like the bread but in a portable size. Mardi Gras is now less than a month away (when this post goes up) and the party has just began. Besides King Cake as a dessert being served during Mardi Gras, you eat Beignets, Bread Pudding and on Mardi Gras you eat Pancake, its even called Pancake Tuesday. A beverage that you consume during Mardi Gras is called Milk Punch, it close a eggnog but doesn't have any egg in it and not as much nutmeg. 1. In a separate bowl, combine flour, baking powder and sea salt. In a larger bowl, cream together butter, brown sugar and granulated sugar until like a fluffy about five minutes. 2. Add pure vanilla extract and eggs to the butter-sugar mixture at one egg at a time until incorporated. Lower the speed on your mixer and slowly add the flower at a third a a time. Scrap the sides every so often. The dough might be a little crumbly, that's okay. Hand kneed the dough until all the flour is incorporated. 4. Divide the dough in half. Wrap the plain dough in clingwrap and chill. Flatten slightly then create a crater add the cinnamon and nutmeg then work the dough until work in well. Wrap dough then chill for 3 to 4 hours. Overnight is better. 5. Preheat oven to 325 degrees. Cover two or three cookie sheets with parchment paper. 6. Divide cookie dough in half. Place the cinnamon cookie dough on the sugar cookie dough then lightly work it together into a swirl like pattern. If the dough becomes soft place in fridge for 20 minutes or freezer for 10 minutes. 7. Sprinkle a little flour on a clean surface or waxpaper. Roll dough out to a 1/4 inch thick. Press cookies out and chill for 10 to 15 minutes. Bake in the oven for 8 to 10 minutes or until lightly golden brown edges. Cool cookies on sheet for 5 minutes then remove to cool completely. 8. For royal icing: add egg whites and cream of tarter to a medium size bowl, turn mixer on to dissolve. Turn up the speed to a high for 5 minutes or until soft peaks. Slowly add in confectioners' sugar a cup in a time then mix for another 5 minutes. Add milk or water to icing a teaspoon at a time until its easily spreadable. 9. Smooth a tablespoon worth of icing onto cookie and smooth over with an offset spatula. Place back onto parchment paper then sprinkle colored sugar on right away. Let the icing set in a fridge or air dry. This may take 30 minutes to 1 hour for it set completely. Love the idea! I can make this with my kids and let them be creative with the sparkle design. 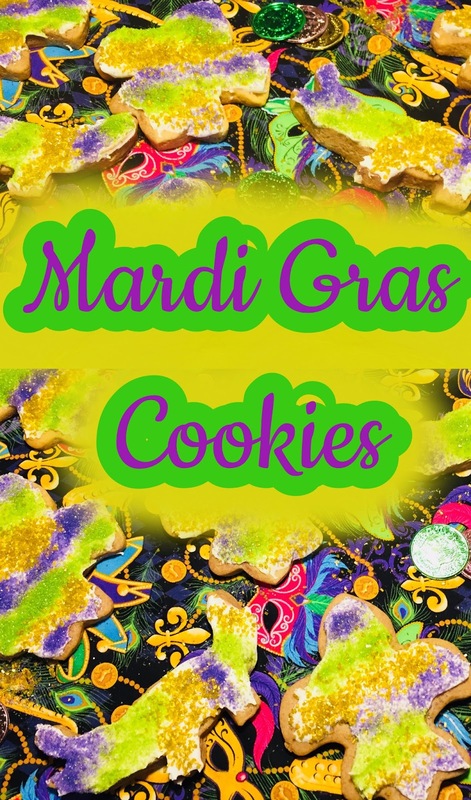 Thanks for sharing such a tasty looking recipe and links to other traditional Mardi Gras foods. Now, we are all set for throwing a party! These look AWESOME! Love them! These look beautiful and delicious! Saving this recipe for next month! These look fun to make, and kids would love to get involved. These are so fun! Rarely do you see cookies with green or blue coloring. They look awesome! These cookies are so festive and fun. I love the bright colors! Woo Hoo! What colourful cookies! They efinitely make you feel like dancing! The name Mardi Gras is absolutely perfect! What a fun idea to make cookies snd add the colors of the day. So colorful and cute! I love these kind of cookies - perfect for birthdays too! How fun and festive!! They look so tasty too! I am in love with these colorful cookies. How creative! Have a great time eating them. I love these Mardi Gras cookies. I would love to bake them myself on weekend. Yummy! What a great idea to make themed cookies! Thanks for the recipe! These are SUPER cute! And pretty, too! 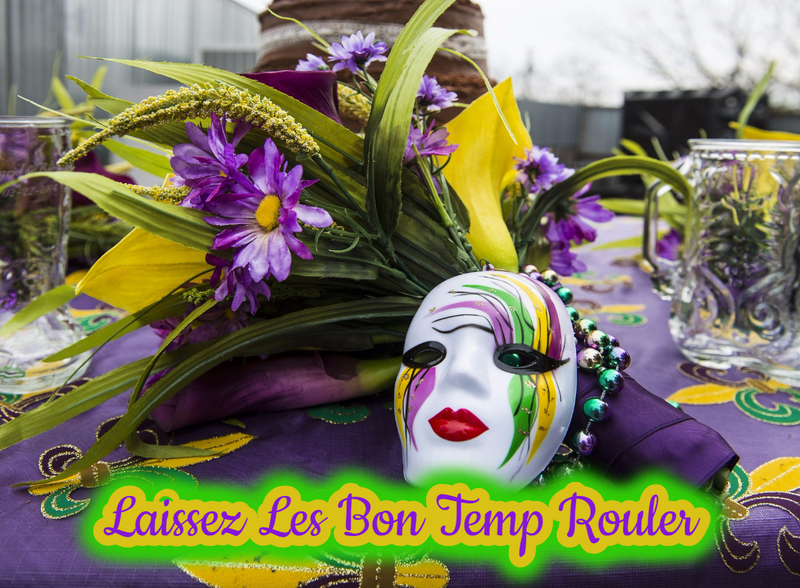 A great recipe share for Mardi Gras, for sure! What a great idea. I love how colorful and celebratory they are. I will definitely be giving these a try so we can get a bit of that Mardi Gras feeling up here in the north. I'm loving your creative recipe! I am definitely going to make these tonight if possible! These look like so much fun! I really want to try out something colorful like this. How inspiring! Cookies sound absolutely delicious! I want to try! i'm such a sucker for cookies lately. I love how bright and colourful these cookies are. They're absolutely perfect for making with the kids! Your cookies are giving such a festive look. With the detailed recipe posted by you, these can be tried at home to get such delicious and colorful treat. These cookies sound so delicious. I like the way you have decorated them, perfect bright colors for party or a get together. I loved your King’s cake bread recipe and I love the cookies! So festive. I just love the colors of mardi gras desserts. So bright and pretty! Super fun looking cookies. I especially like the alligator shape-so fun. They sound so easy to make and fun to eat..will definitely try them over the weekend! Such a colorful cookie. Great that you can make it in no time. These Mardi Gras Cookies looks cute and delightful. These would be so fun to make! The colours of these cookies are wonderful. Definitely a recipe I'd love to try with the kids. They'll enjoy making them! What a great, simple recipe. The colors and the shapes are really fun and are sure to brighten up any party table. I don't think I have ever had milk punch but it sure sounds good. Wow! A month away. Those cookies are too cute. Thanks for sharing I've been looking for this recipe on Pinterest I plan to make some next week. This sounds and looks yum! I absolutely love cookies! These colorful cookies look amazing! The flavors in the recipe are amazing, I bet it will be so much fin to try these at home. These cookies are so adorable and festive! I love all of the colors. So cute!